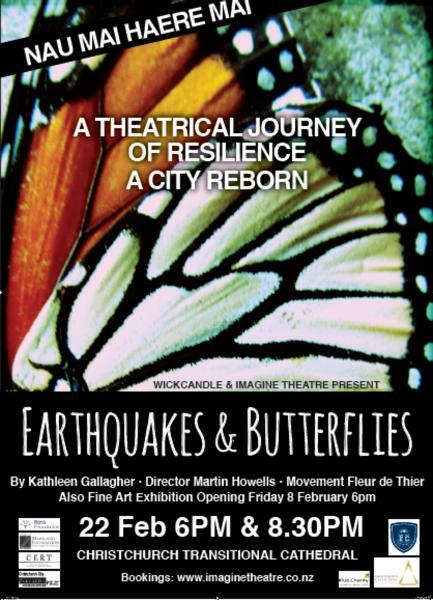 The eighth anniversary of the 22 February Canterbury earthquake will see a new adaptation of Kathleen Gallagher’s novel “Earthquakes and Butterflies” take the stage in the Christchurch Transitional Cathedral. Imagine Theatre is presenting two performances on the anniversary of the quakes, commemorating the event which changed lives and the city forever. Director Martin Howells, says the production is an opportunity for Cantabrians to acknowledge and reflect on the events. Howells has condensed the 2018 material, highlighting the poetic and universal aspects of author Kathleen Gallagher’s work. Earthquakes and Butterflies draws on Māori mythology with some of the text in Te Reo Māori. There’s also a rich soundscape including live performance on traditional Māori instruments (Taonga pūoro played by Geoff Low) and violin. The six actors and musician bring the work to life with a dynamic physical score devised in collaboration with movement director, Fleur de Thier. The two performances are at 6pm and 8.30 pm on 22 February.